Join the discussion on our forums! Come discuss Proud Defender over in our dedicated Proud Defender discussion topic. Taunt. Has +2 Attack while you have no other minions. It'll take a humble offender to defeat him. Underrated. Without Tar Creeper Stonehill Defender and Saronite Chain Gang this should see a lto of plays. 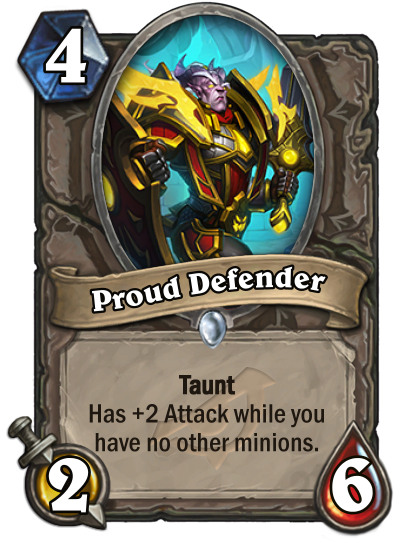 I like the fact his effect is not battlecry. You have ascended, Tar Creeper.